Wheat and barley were two of the earliest plants to be cultivated, and primitive people living as early as 5000 B.C. are known to have eaten these grains. Eventually it was discovered that adding water to the grain made it more palatable, and people experimented with cooking the grain and water mixture on stones that had been heated in a fire. In this manner, porridge and flat breads were developed. The ancient Egyptians were known to grow barley and wheat. Excavations of their cities revealed that they enjoyed flat breads with nearly every meal. It is likely that leavened, or raised, bread was discovered accidentally when a wheat and water mixture was left in a warm place, causing the naturally occurring yeast to produce a puffed-up dough. It is also possible that a piece of leftover dough was mixed into a new batch, producing the same results. Cooking the dough in an oven over an open fire produced an even better grade of bread. The first ovens were clay structures in which a wood fire was burned. When the wood had completely burned, the ashes were scooped out from an opening on the side of the oven. The wheat dough was placed inside the oven and then the opening was sealed. By the time the oven had cooled, the bread was baked. The Romans are credited with inventing grinding methods by rubbing grain between two stones. Eventually, the manual grinding process was replaced by a mechanical one in which one stone revolved on top of a lower, perpendicular and stationary stone. In the beginning, the wheel stones were driven by cattle or slaves. Later, water mills or windmills provided the power. Grinding was a time-consuming process and for centuries, leavened bread remained a pleasure reserved for the wealthy. White bread was an even rarer commodity. In fact, a family's social and economic status could be determined by the type of bread they ate. The poorest families ate the dark whole-grain bread. Ironically, nutritionists today favor whole-grain breads over those made with white flour. Bread making remained primarily a home-based function well into the Middle Ages. About that time, some families, particularly those without ovens of their own, began to take their dough to small local bakeries to have the dough shaped and baked. As towns and villages sprang up throughout the countryside, bakeries flourished and home baking decreased significantly. These local bakeries had large brick ovens heated by wood or coal. The dough was moved in and out of the ovens with a long-handled wooden shovel called a "peel." Many small, independent bakeries still employ peel ovens although they have since been converted to use gas or oil fuel. bread making. High-speed machinery can now accomplish the kneading and ripening processes in a matter of seconds. For some time, bread was thought to be fattening, and many people avoided it in their daily diet. Studies showed, however, that it was toppings such as butter that accounted for most of the fat-induced calories. In fact, bread is an excellent source of low-fat, complex carbohydrates. The renewed interest in bread has led to consumers' taste for a variety of bread types. No longer is sliced white bread the norm. Grocery store shelves now offer myriad wheat breads and multigrain breads. Bread is made with three basic ingredients: grain, water, and bakers' yeast. The harvested grain is ground according to the type of bread being made. All grains are composed of three parts: bran (the hard outer layer), germ (the reproductive component), and endosperm (the soft inner core). All three parts are ground together to make whole wheat and rye breads. To make white flour, the bran and the germ must be removed. Since bran and germ contain much of the nutrients in grain, the white flour is often "enriched" with vitamins and minerals. Some white flour has also been fortified with fiber and calcium. The grinding takes place at grain mills, which sell the grain to bakeries in bulk. The bakeries keep the grains in storage sacks until they are ready to be used. In the baking factory, water and yeast are mixed with the flour to make dough. Additional ingredients such as salt, fat, sugar, honey, raisins and nuts are also added in the factory. is piped into the mixer. This mixture is called "gluten" and gives bread its elasticity. A pre-measured amount of yeast is added. Yeast is actually a tiny organism which feeds off the sugars in the grain, and emits carbon dioxide. The growth of the yeast produces gas bubbles, which leaven the bread. Depending on the type of bread to be made, other ingredients are also poured into the mixer. Modern mixers can process up to 2,000 pounds (908 kg) of dough per minute. 2 The mixer is essentially an enclosed drum that rotates at speeds between 35 to 75 revolutions per minute. Inside the drum, mechanical arms knead the dough to the desired consistency in a matter of seconds. 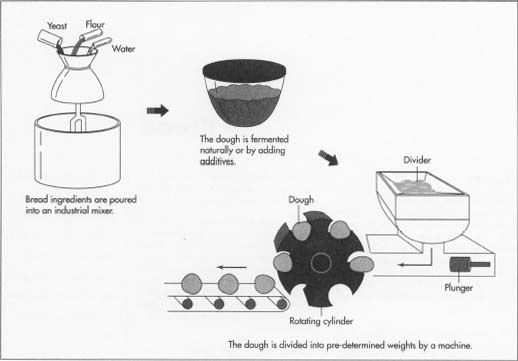 Although modern bread production is highly computerized, the ability of the mixing staff to judge the elasticity and appearance of the dough is critical. Experienced personnel will be able to determine the consistency by the sound of the dough as it rolls around the mixer. The mixing process takes about 12 minutes. 3 Three methods are used to ferment the dough. In some plants, the high-speed machinery is designed to manipulate the dough at extreme speeds and with great force, which forces the yeast cells to rapidly multiply. Fermentation can also be induced by the addition of chemical additives such as 1-cysteine (a naturally occurring amino acid) and vitamin C. Some breads are allowed to ferment naturally. In this instance, the dough is placed in covered metal bowls and stored in a temperature-controlled room until it rises. 4 After the dough has fermented, it is loaded into a divider with rotating blades that cut the dough into pre-determined weights. 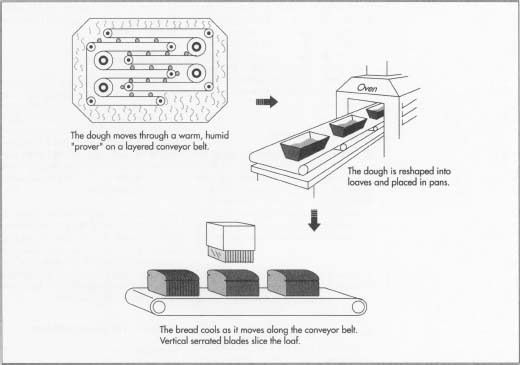 A conveyer belt then moves the pieces of dough to a molding machine. The molding machine shapes the dough into balls and drops them onto a layered conveyer belt that is enclosed in a warm, humid cabinet called a "prover." The dough moves slowly through the prover so that it may "rest," and so that the gas reproduction may progress. 5 When the dough emerges from the prover, it is conveyed to a second molding machine which re-shapes the dough into loaves and drops them into pans. The pans travel to another prover that is set at a high temperature and with a high level of humidity. Here the dough regains the elasticity lost during fermentation and the resting period. 6 From the prover, the pans enter a tunnel oven. The temperature and speed are carefully calculated so that when the loaves emerge from the tunnel, they are completely baked and partially cooled. While inside the tunnel, the loaves are mechanically dumped from the pans onto shelves. The baking and cooling process lasts approximately 30 minutes. 7 The bread continues to cool as it moves from the oven to the slicing machine. Here vertical serrated blades move up and down at great speeds, slicing the bread into consistently sized pieces. 8 Metal plates hold the slices together while picking up each loaf and passing it to the wrapping machine. Pre-printed plastic bags are mechanically slipped over each loaf. At some bakeries, workers close the bags with wire twists. Other plants seal the bags with heat. Commercial bread making is held to strict government guidelines regarding food production. Further, consumer preferences compel bread producers to maintain a high quality standard of appearance, texture, and flavor. Therefore, quality checks are performed at each step of the production process. Producers employ a variety of taste tests, chemical analyses, and visual observation to ensure quality. Moisture content is particularly critical. A ratio of 12 to 14% is ideal for the prevention of bacteria growth. However, freshly baked breads have a moisture content as high as 40%. Therefore it is imperative that the bakery plants be kept scrupulously clean. The use of fungicides and ultraviolet light are two popular practices. "'Breadworks' Program Takes the Work Out of Breadmaking." Bakery Production and Marketing, December 1993, p. 27+. Denny, Sharon. "Enough Dough for Every-one." Current Health, December 1994, p. 25+. Harper, Roseanne. "Bred to Rise." Supermarket News, January 30, 1995, p. 21+. Ryan, Nancy Ross. "Flour Power." Restaurants and Institutions, October 15, 1994, p. 137+. Any help in this will be highly appreciated.